¡No Pasarán! : Misleading Statistics: Would the EU Really Dominate the Olympics in Medals Won If It Were "United"? Misleading Statistics: Would the EU Really Dominate the Olympics in Medals Won If It Were "United"? There is a meme online, as there has been four (and more) years before (I first heard it years ago by the presenter of a French TV news program), claiming that — imagine! 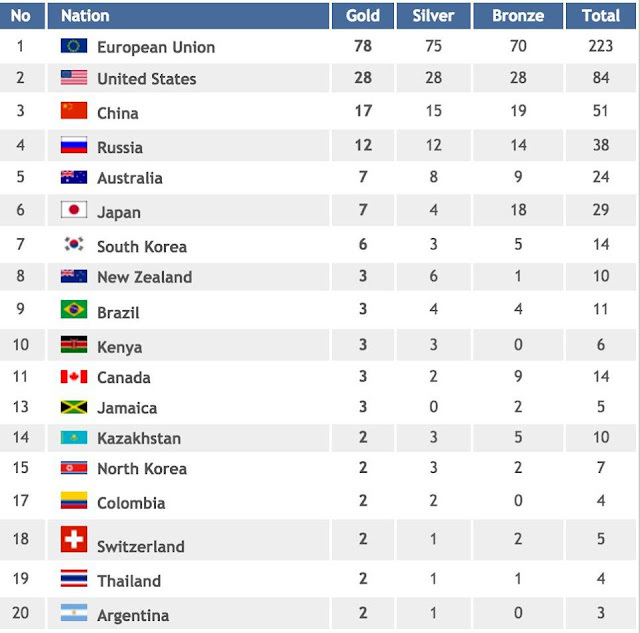 — if the European Union were truly united, they would dominate the amount of medals won at the Olympic Games. This is for my US friends who think they are ahead in the 2016 Olympics. Only because Europe has no sense of unity! It is nonsense, of course, utter nonsense. It is also evidence of the misleading nature of statistics, not to mention common folks' tendency to trust simple catchphrases. Sure, if you add up the medals from France, and Germany, and Denmark, and the UK (for how much longer? ), you arrive at a greater total number of medals. But listen: you can't have it both ways; either you compete as one entity or you compete as 28 (soon 27). Otherwise, you have to admit the "solution" isn't a simple as the would-be statisticians would make you believe. If a certain multitude of medals ought to be counted as one, why shouldn't the logical conclusion go in the other direction, and have unitary competitors "divided" into their respective constituencies? Why shouldn't Canada ought to have one third to half as many candidates (or teams) as the EU for each sports branch, not 1 as now but 9 extra for the Canucks' 10 provinces (Ontario, Québec, British Columbia, etc…)? Shouldn't the United States, meanwhile, have nearly double (!) the number of candidates (or teams) as the EU, an extra 49 for a total of 50 states, with contenders from Texas, Massachusetts, North Dakota, etc, etc, etc? Similarly, in the Soviet era, the USSR had one candidate (or one team) per sports branch at the Olympics, not 15 for the number of its constituent (Soviet Socialist) republics. How sure can you be so sure that the EU would dominate the Olympics if its' 28 contenders had to compete against the Canadians' 10 as well as against the Americans' 50?